Martin O’Neill paid tribute to Ireland’s match-winner Alan Judge after tonight’s match. Alan Judge celebrates scoring the winner. 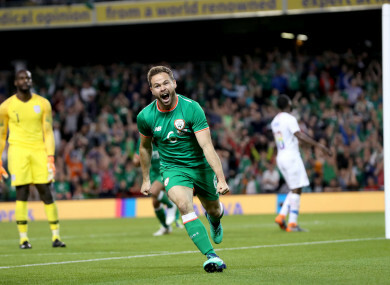 IRELAND BOSS MARTIN O’Neill paid tribute to match-winner Alan Judge after the Brentford star scored the winner in tonight’s Ireland-USA friendly. Judge was out of action for over a year with a broken leg until recently, and he was barely on the field having been introduced off the bench when he grabbed the winner in the dying moments of the match, producing a clinical finish after being set up by James McClean. “It’s very, very pleasing, pleasing for him because he’s had a really tough time,” O’Neill said. “He thought his career was over. It was a very serious injury. As O’Neill suggested, Judge was clearly delighted to score the winner, celebrating his goal passionately and the 29-year-old will hope he can build on this moment. Having spent much of this season recuperating, he has been mainly used off the bench in the Championship since his return from injury in January. “To a certain extent, he got some sort of reward for [his perseverance] tonight and I’m really pleased,” O’Neill added. Meanwhile, despite seeing the visitors lose, USA caretaker boss Dave Sarachan felt the experience gained by his side — who have an average age of 23 — will prove invaluable in future. “For the most part, I thought that the game was pretty even,” Sarachan said. “The Irish were relentless and they fight and wear you down. They play balls forward quickly and we dealt well with them in the main. “We dealt with their set pieces but we were punished late on. “At the end of the day we almost came away with a result but credit to Ireland they never quit. “We were caught late at the end which is disappointing for us. But for our young guys this is what it’s all about. “This is always a tough place to play but it’s a great learning exercise for the guys. Email “'He's had a really tough time. He thought his career was over'”. Feedback on “'He's had a really tough time. He thought his career was over'”.